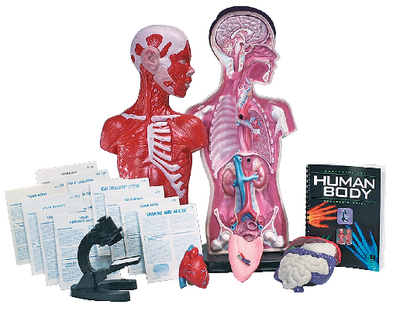 By combining the 3-D Human Torso Model with the Human Body Microslide Lesson set, students obtain both a three-dimensional and up-close look at the Human body, providing a highly effective visual that students will appreciate. Further investigate the digestive, nervous, circulator, urinary and musculo-skeletal systems through the 31 included lessons and hands-on experiments which are backed with teacher's guides. This comprehensive package conveniently includes student worksheets that are reproducible, background information, assessment notes, and detailed tables with illustrations providing you with everything you need to easily implement the lessons into your classroom.